We have been balling and burlaping since 1971. We know our plant material and how and when to dig it. Balling and Burlaping--This is the way we harvest our field grown stock. The number of problems we had with the 50,000 trees we balled and burlaped last year was negligible. The following things have allowed us to ahcieve this. 1) Long Shovels. We employ shovels with a blade 18" long when they are new. This allows the digger to dig a deeper ball. It also allows the digger to cut off long roots coming out the bottom of the ball without hammering and cracking the ball. 2) Root Prunning. 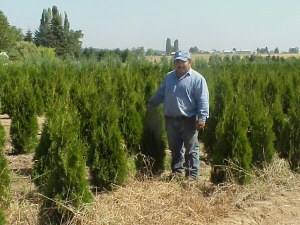 We root prune all of our conifers except arborvitae. We are able to accomplish this using the long shovels we use for digging. 3) Plant Only Completely Rooted Material. 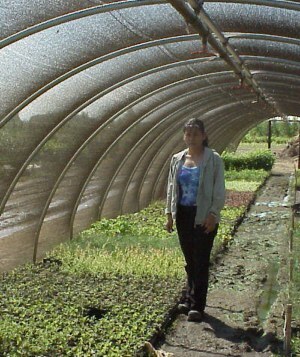 All planting stock comes from big root bands or gallons. We never plant a bareroot plant into our fields. We discard any plants that haven't filled their container with roots. 4) Time Release Fertilizer. We keep time release fertilizer around our plants 12 months a year. This keeps the roots feeding closer to the tree, thus putting more roots in the ball. Digger Identification: Each digger is assigned a marking tape color. When he completes a ball he attaches a piece of his marking tape to the ball. This allows diggers to take pride in their work and allows management to deal with any problems that might arise. Star Wire: We recommend star wires be attached to most trees 5-6' or larger. There is a charge for each star wire. We do not ship trees 5-6' or larger long distances without star wires. Star Wire Included In Price: We include star wire in the price and require the wiring of: sequoia gigantium, sequoia semprervirons, calocedrus decurrens, and sculptured B&B material. All star wiring is tightly crimped. Machine Digging: We have a 32" Care Tree digger that digs balls from 24" to 32". We us it for larger material or where the customer requires it. Experience: We have been balling and burlaping since 1971. We know our plant material and how and when to dig it. Shipping: We ship through out the U.S.A. We weigh our trees and are therefore able to get trucks loaded to the correct weight. We are happy to fill partials. We ask our customers to hire the truck--we do the rest. Talk to us about truck footage and how to calculate it.